Speed & Strength Black 9 Collection -- Righteous Protection! New for 2014, the S&S Black Nine collection combines style and protection for the urban rider not willing to sacrifice anything in the name of looking legit. Armor infused flannels, reinforced sneakers and new badass graphics for their classic SS600 helmet, are just some of the offerings that will be seen this year from Speed and Strength. Whether you are cruising LA on a custom bagger or Brooklyn on a vintage CB, this understated armored flannel shirt will keep you looking righteous without letting on to the fact you value your body parts. 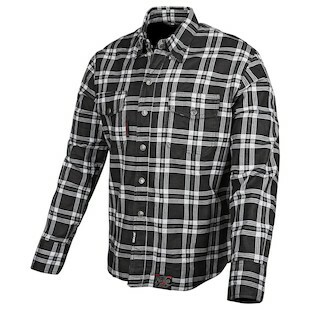 The Speed & Strength Black 9 Moto Shirt is not just all form, but function as well, hiding kevlar reinforcements between that sweet plaid jig. Wear it by itself or under your favorite non-armored jacket for added protection. You can never go wrong with a classic flannel. Looking to replace those tired Chuck’s with a proper moto shoe? Look no further. Speed and Strength has you covered with the Black 9 Moto Shoe. 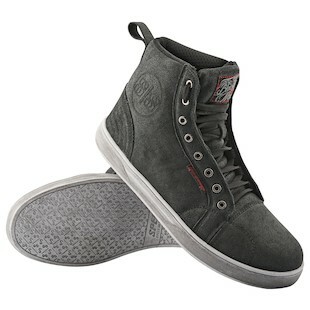 A reinforced heel and ankle mean that you can keep it casual without sacrificing style or protection. Coming in three color options (Black, Grey and Tan), the Speed & Strength Black 9 Moto Shoes offers a lot of style and versatility that will sure to be right at home in your urban jungle. Do you know what a Black Nine is? We do not, but if you do this is your lid. This new graphic from Speed and Strength is infused with all of that grimy pool hall flavor that Fast Eddie Felson or Jax Teller would be all over. With its matte black finish and “vintage” scratches this helmet looks like it has been ridden hard and possibly used in a bar fight or two. So if you need a new lid to protect your dome on your way to the pool hall or Sons of Anarchy fan club meeting, the Speed & Strength SS600 Black Nine Helmet is for you. 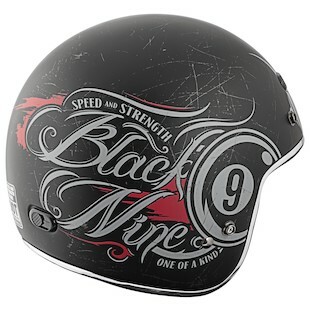 Whatever Black Nine is or means we can safely assume that the new Speed and Strength line is directed towards minimalist motorcyclists and does a great job of combining style and protection. More and more companies are attempting to make gear that looks good both on and off the bike, making the use of motorcycles more prolific and allowing people to ride in confidence without sacrificing style or comfort. Speed and Strength has tapped into this new trend and as their latest product line shows, they are hellbent on giving the people what they want!